Always time for a team pic! While basketball is what we love and what we teach, we’re not just about making better basketball players. The ultimate and real purpose of the ECBA is to teach our players though the player/coach mentorship how to find success on and off the court. The ECBA is a basketball program based in Gresham, Oregon currently working with high school student athletes in the area. ​The program focuses not only focuses with on court success, but we are about preparing these young student athletes with tools to succeed off the court as well. 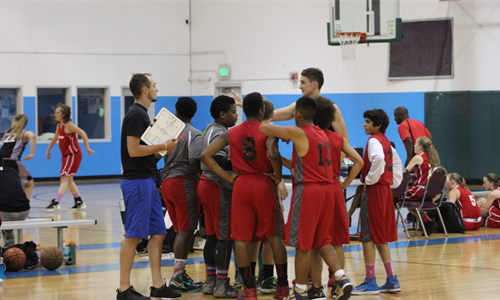 The ECBA provides student athletes with an opportunity to work with others from around the area, work with current high school coaches, learn from mentors of all different backgrounds, and find avenues to put the student athlete in the best place to succeed on and off the court. The ECBA is proud to announce their first ever 3 on 3 tournament being hosted on December 19th at Clear Creek Middle School! There will be high school and adult brackets. Volunteers, we could use your help! Jeremy and I need a handful to help at our "Battle of East County" 3 vs 3 tournament.